Murdering a U.S. 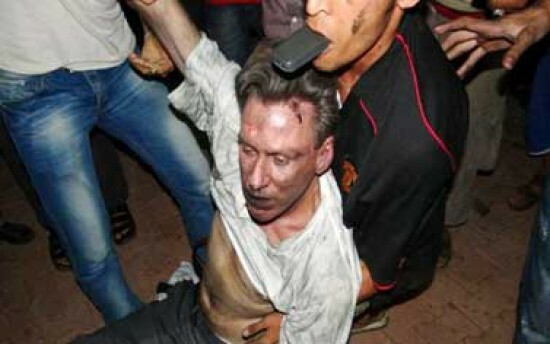 Ambassador and dragging his body through the streets in the name of their God is worse than barbaric, worse than insane. As they "stand up" for their "prophet", with this type of act (no surprise, Muhammad himself was a man of violence) simultaneously their is a bloodbath of Christians they are murdering around the world, simply because they are Christians. They are practicing their Jihad..and we refuse to to wake up, our leaders in fact working in concert with the lawlessness and murderous Muslim Brotherhood...and arming Syrian rebels who we know for certain many are Al Qaeda operatives. Be ready people, this is only the beginning of what they are planning for non-Muslims. - W.E. The U.S. ambassador to Libya and three embassy staff were killed as they rushed away from a consulate building in Benghazi, stormed by al Qaeda-linked gunmen blaming America for a film that they said insulted the Prophet Mohammad. Let’s make one thing really clear here, if you disagree with Islam or say anything that can be construed as an insult to the religion of peace, you can lose your head and your life. This heinous attack on Americas Libyan ambassador, is one more example of the response from Islamist extremist and one we should take seriously here in the US. We must ask ourselves, where are the Islamist moderates condemning the barbarous acts carried out in Libya? Where is the outrage? I suppose most Americans are to busy watching Dancing with the Swamp People to really care as, it’s all happening over there, nothing to worry about! The Ambassador was cut down in cold blood. He was murdered, and then his body dragged through the street. What kind of people engage in this grotesque display of barbarity? Will the US bring those responsible to justice? I doubt it. Most likely there will be the usual moment of silence at the state funeral so as not to offend anyone and Obama will condemn the act promising to get to the bottom of the incident, but nothing will be done, and most Americans will forget about the incident. The west needs to come to an understanding of what is happening in the Middle East. This incident is a cogent example of the rise of the Moslem Brotherhood and the quest for an Islamic Caliphate, with Jerusalem as it’s Capital. Sharia law will be enforced and any one who holds another belief, be it Shia Moslem, Christian, or Druze, will be attacked. This is where the Middle East is headed. Please take a moment to watch this video that I play when I’m on the road speaking. It was filmed in May 2012 and was right before the Egyptian elections. You will see an Imam who states unequivocally that Jerusalem will be the capital of the United Arab States. The goal is to dominate the entire region, from Pakistan to Spain, with every grain of sand under the rule of the Caliphate. In closing todays post: Most Americans are tolerant and believe that Islam is a religion of peace. If that is true we should see Imam’s condemn the attacks. We should hear from Moslems who will assure us this was the work of radicals. So far the silence is deafening.